Cones to mark the playing area (if outside). Give 2 – 4 students the evil red balls and put them inside the center circle of the gym (these are your dog catchers). Tell everyone else that they are dogs, and tell them that they have 5 seconds to get into one of the four corners in the gym. The object of the game is to switch to a different corner, when the teacher yells “SWITCH,” without being tagged by a dog catcher. Each time you successfully switch to a new corner, without being tagged by a dog catcher, you receive one point. 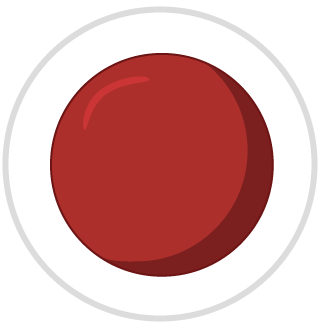 If you are tagged by a dog catcher, you lose all of your points and must take the evil red ball from the dog catcher and go to the middle of the gym (you are now the new dog catcher for the next round). When the teacher yells “SWITCH,” you MUST switch corners. You MUST also always get as deeply into the corner as you can without contacting other people. The winner of the game is the student with the most points after a predetermined amount of time and/or rounds. 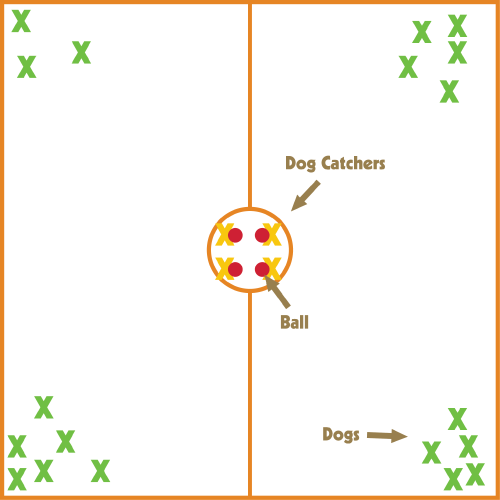 To alter the difficulty level, increase the number of dog catchers and/or allow the dog catchers to throw their balls (i.e. dodgeball-style) and/or tell the “dogs” that they must visit each corner once before they are allowed to return to a corner that they have already visited. Remind students to keep their eyes open and heads up, and to not hug the walls too closely when they are running (as there may be someone coming right at them in the opposite direction). How does the Dog Catcher tag the runners? Do they throw the ball at them or run and physically touch them? You can play it either way. The main goal is to have all kids moving as quickly and consistently as possible. Whatever works for your kids is the best way to do it! Thanks for the comment!